At Dream Kitchens & Baths our selection of bath cabinetry covers all the construction options in the market. We carry Bertch Bath which is an exclusive bathroom cabinet line that has an excellent finish and many style and color options. We also use our kitchen cabinet lines including Marsh Furniture and Mouser Custom for additional options on style and finish. Our countertop selections include cultured marble, quartz, and natural granite. The quartz and granite options have gained in popularity due to the local fabricators offering “Remnants”. Granite or Quartz remnants gives the client a real high end looking option in the bath, without the high end cost of stone products. We also cover the plumbing options with our brand selections. We are dealers of Kohler, Delta, Moen, Elkay, Toto, American Standard, etc. We also install ADA Baths. 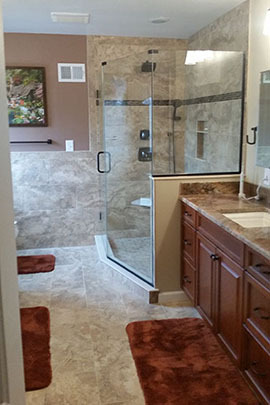 Tile, ceramic and porcelain has become the normal wall product being used as a shower surround or a bath tub surround. The selections of tile makes maintenance much easier today than in the past. 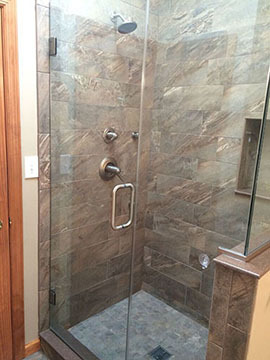 We typically install bigger tile with much closer grout joints to simplify grout maintenance. 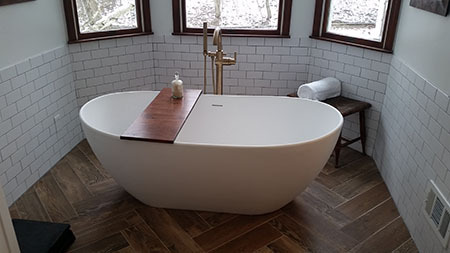 Flooring in a bath is typically tile or Karndean, which is a high performance vinyl. Contact us for more information.